Google co-founder and CEO, Larry Page, continues to have big expectations for his employees: come up with products and services that are 10 times better than their competitors, hence “10x” – that’s one order of magnitude! Many entrepreneurs and start-up companies, they seem to ‘shoot for the moon’! Far more than 90% of these ventures fail within just a few years. Few, such as Google, succeeded and grew to dominate internet giants. The question remains though if they can maintain the innovative pace of 10x when the innovation rate tends to sink closer to 10% in matured companies. “There is no reason anyone would want a computer in their home.” – Ken Olsen, founder of Digital Equipment Corporation, 1977 – just a few years before the first IBM PC sold. Microsoft cultivated software licensing to sell one piece of software millions of times over effortlessly at minimal cost. As disruptive and transformative ventures grow and mature, the definition of what is perceived ‘innovate’ changes. Both momentum and focus shifts. With size companies struggle to continue innovating similar to their nimble start-up origins. What happens? With size comes a downshift from disruptive to incremental change. Simplicity makes space for adding features. Adding features makes products more complex and ultimately less usable and appealing to the majority of customers. Look at Microsoft’s Offices products, for example: Wouldn’t you wish they came out with a ‘light’ version with reduced feature complexity by let’s say 75%, so the software becomes easy to use again? It also starts haunting Google, as their established products such as Search or Gmail need to be maintained. Additional “improvements” aka. features creep in over time. Perhaps you noticed yourself that recently Google search results seem to be less specific and all over the place while the experimentation-happy Gmail interface confuses with ever new features? Even the most iconic and transformative companies experience the reduction of their innovative rate from 10X to an incremental 10% or so. Funny thing is that -at least in technology- incremental improvement quickly becomes obsolete with the next disruptive jump. 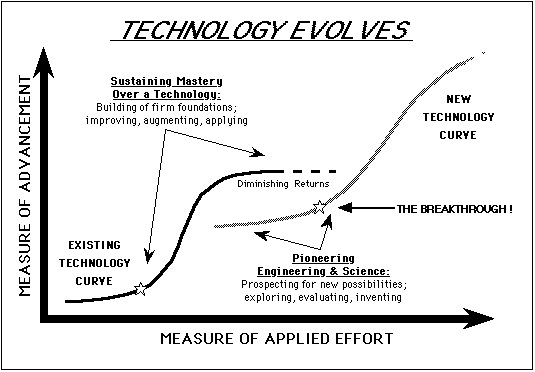 The current technology matures up along the S-curve (see graphics) and generates revenue, but the next disruptive technology emerges. Companies hold on as long as they can keeping revenue flowing by adding features or improvements of sorts to gain or maintain a marginal competitive advantage. Thus, incremental improvement and process optimization found their place here to minimize cost and maximize profit in a market where the product became a commodity, so the competition is based only on price. The new technology does not yet make significant money in the beginning at the beginning of the next S-curve. The few early units produced are expensive, need refinement and are bought by enthusiasts and early adopters who are willing to pay a steep premium to get the product first. Nonetheless, development reached the point of “breakthrough,” becomes appealing to many and quickly takes over the market: the big jump onto the next S-curve gains momentum. Suddenly, the former technology is ‘out’ and revenue streams deflate quickly. Large and matured organizations ride on an S-curve as long as possible. They focus top-down on optimizing operations. Little effort is made to address the underlying limitation of the current technology and seeking out risky new successors. Maturing companies tend to transform into a ‘machine’ that is supposed to run smoothly. A mind shift happens to avoid risk in order to produce output predictably and reliably at a specific quality level to keep operations running and margins profitable. Incremental process improvement becomes the new mantra and efficiency is the common interpretation of what now is considered ‘innovative’. 10X has turned into 10%. To keep up with the ambitious 10x goal, companies would have to constantly re-invent themselves to replicate their previous disruptive successes. Apple waters down their appealing simple user interface by adding features and clinging to defend their proprietary standards from outside innovations. On top of it, all giants tend to face the stiffening wind of governmental scrutiny and regulation that influences market dynamics to protect the consumers from overpowering monopolies that jeopardize competition and innovation. This is a fertile ground for the next wave of innovators, small Davids, to conquer markets from the Goliaths with fresh ideas, agility, and appealing simplicity. Where does your organization stand on the S-curve, riding the current curve with 10% or aiming high at the next with 10x? Small Jobs – job descriptions appear that narrow down the field of each employee’s responsibility while limiting the scope by incentivizing employees to succeed within the given frame. Safe Recruiting – practices shift to playing it safe by hiring specialists from a well-known school with a streamlined career path to fit the narrowly defined mold of the job description. They newbies are expected to replicate what they achieved elsewhere. To risk is taken to getting the ‘odd man out’ for the job, a person who took a more adventurous path in life and thinks completely different, as this may disrupt the process and jeopardize the routine output by shifting the focus away from operations. Homogenized workforce – as a consequence of hiring ‘safely’, the workforce homogenized thereby lowering the innovative potential that comes with the diversity of thought and experience. Visionaries leave – with the scope of business shifting, the visionary employees that drove innovation previously lose motivation when innovation and creativity slows. Now they are held to operate in a business space where they do pretty much the same thing as their competition. Naturally, these go-getters move on, as it is easy for them to find a challenging and more exciting new job in a more dynamic place. – This ‘leaky talent pipeline’ gets only worse and costly when the talent management focus shifts to talent acquisition and leaving talent retention behind. Procedures for everything – operating procedures regulate every detail of the job. The new ‘red tape’ is not limited to the necessary minimum but rather by the possible maximum. Short-term focus – work output becomes mediocre and focuses on short-term goals and sales targets; the next quarter’s numbers or annual results take priority over following the big dream. Sanitized communications – broader communications within the company become ‘managed’, monitored, ‘sanitized.’ A constant stream of (incremental) success stories pushes aside an open discussion to target the bigger problems. Opportunities are missed for open dialogue and creative disruption that fuels the quantum leaps forward to outpace the competition. Peer to peer communication is monitored to remain ‘appropriate’ and can even be actively censored. Trust in management and subsequently also among employees erodes. The real problem is the shift of mindset in top management that quickly works its way down: not wanting to take the risk of being first, which includes avoiding the risk to fail while chasing to next big opportunity or technology. Instead, they sail the calmer waters among more predictable competition fighting for small advantages and holding on to the status quo opportunistically as long as they can. In some cases, the management even acknowledges the strategy shift from ‘leader’ to ‘fast follower’ despite whatever the company motto proudly promotes – and thereby accepting 10% and avoiding to leap ahead of their competition by bold and game-changing 10x moves. Interestingly, these same managers still love to look over the fence to awe the iconic leaders but steer away to take charge and work to become the leader again themselves. The nagging question remains if they could actually pull it off getting into first place. Outside-of-the-box thinking may still be encouraged in their organization but is not acted upon anymore. Internal creativity or ideation contests become more of an exercise to keep employees entertained and feeling engaged, but the ideas are hardly being funded and executed. Instead, company resources are concentrated to run the incremental machine predictably and reliably at 10% as long as its profitable, no matter what. – They simply have no resources to spare and dedicate to 10x! These businesses undergo a cycle of breaking through by successful disruption in a narrow or completely new segment, then continued growth to a size where the organization slows down to an incremental pace and somewhat stagnating innovation. It may then get driven out of business by the next disruptor or pro-actively break up into more competitive fragments that allow for agility and risk-taking once again to become leaders in their more closely defined space of business. This closes the cycle they are to go through next. There is a strong parallel between evolution and Charles Darwin’s survival of the fittest. Keeping this cycle in mind, it becomes easier to see why management undergoes the mind shift to predictable and incremental improvement during the massive growth phase of the company in the center of the S-curve. It is also the time when the disruptive innovators have jumped ship to join the next generation of cutting-edge innovators and risk-taking disrupters that prepare to take the leap working on the next S-curve. The question is where you want to be: the true risk-taker or the incremental improver? Understanding the trajectory and current location of your company helps to make the right decision for you. It can save you from frustration and be banging your head against corporate walls and be wasting your energy in a dinosaur organization that is just not ready anymore for your ‘big ideas’ and quick moves outside its production-house comfort zone. This leaves some of us thinking which way to turn. If you are looking for predictability, longer-term employment (an illusion these days one way or another) and good night sleep, this is the place you will feel comfortable in. Otherwise, dare to follow the risk-taking visionaries like Elon Musk (the brain behind PayPal, SpaceX, and Tesla Motors; see his recent great interview) to move on. Shoot for the moon (or Mars, if you are Elon Musk), change the world no matter what and enjoy what you do!